荆薇, 宋娜, 车晓芳, 侯科佐, 杨向红. DNMT3a对胰腺癌细胞吉西他滨敏感性的影响[J]. 中国医科大学学报, 2018, 47(10): 900-904. JING Wei, SONG Na, CHE Xiaofang, HOU Kezuo, YANG Xianghong. Effect of DNMT3a on the Chemosensitivity of Pancreatic Cancer Cells to Gemcitabine[J]. Journal of China Medical University, 2018, 47(10): 900-904. Abstract: Objective To evaluate the effect and mechanism of DNA methyltransferase-3a (DNMT3a)on the chemosensitivity of pancreatic cancer cells to gemcitabine (GEM). Methods MTT assay was used to determine the effect of GEM and DNMT3a on the proliferation of pancreatic cancer cell line, Panc-1. 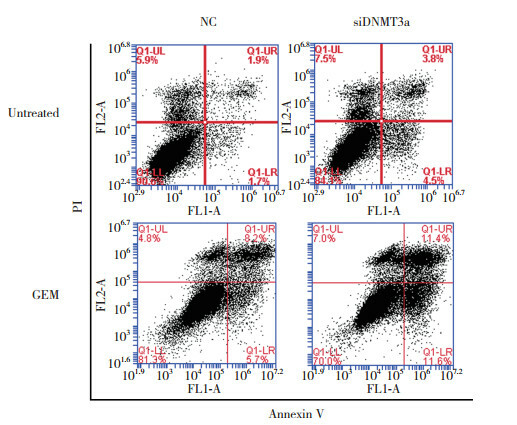 Cells were transfected with siRNA to downregulate the expression of DNMT3a. The expression of DNMT3a, CDA, p-STAT3s, and STAT3 in PANC-1 cells transfected with siDNMT3a were detected by Western blotting. Flow cytometry was used to detect apoptosis. 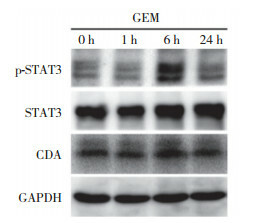 Results Downregulation of DNMT3a expression increased the sensitivity of Panc-1 cells to GEM, reduced the upregulation of p-STAT3 and CDA expression induced by GEM, and increased the apoptosis induced by GEM. Conclusion Downregulation of DNMT3a expression increased the chemosensitivity of pancreatic cancer cells to GEM by inhibiting the activation of STAT3 and expression of CDA. 1）P < 0.01 vs control group（0 μmol/L GEM）at the same time.